Original Monotheism and the Rebuttal from Missionaries | J.W. Wartick -"Always Have a Reason"
One of the strongest pieces of evidence for original monotheism is the presence within many cultures of an early belief in a “Great Spirit” or a single high god. Often, belief in this deity continues, but that deity is seen as far off and largely uninterested in the affairs of people due to some great sin in the past or present (readers should note that I am generalizing to an extreme degree here and are encouraged to read the book discussed herein for more and better details). Oddly, anthropologists and others have persisted in alleging that this belief is itself a product of missionary activity rather than a reflection of history. Winfried Corduan, in his recent book In the Beginning God: A Fresh Look at the Case for Original Monotheism, addresses this claim head on. The claim continues to be found in text books noting that, for example, “Christian ideas had evidently spread from tribe to tribe in advance of the missionaries…” (Spencer, Jennings, et al. Native Americans, 366, cited in Corduan, 204, full citation below). Think about this claim for a moment, though. Suppose Westerners make their first contact with a native tribe. This tribe demonstrates a belief in a high god who has grown angry over sin and thus remains distant. Now, the claim is made that instead of this being a belief the tribe has retained over time, it has actually come from Christian missionaries and spread, like a game of telephone, from tribe to tribe ahead of the missionaries themselves. Corduan notes a major difficulty with this. Apart from being a wholly “a priori declaration,” this claim runs counter to findings of how cultural diffusion works. “If these supreme beings were inconsistent with the rest of these cultures, if in some tribes they never received any worship…. it makes no sense that all of these tribes picked [monotheistic beliefs] up instantaneously. It is utterly implausible, which may just be the reason there is no evidence for it” (204). Realistically, this “rebuttal from missionaries” makes little sense of the data at hand. Historically, however, it gained credence through a general bias against anything a Christian missionary might report. “The dogma that no Christians, particularly no missionaries, could be trusted for anything they reported, except, of course, when it happened to suit what the academicians in power were advocating, was deeply ingrained in the universities of Europe at the time…” (90). One must realize how true this statement is. The very people who were studying anthropology and coming to conclusions about how any reports of original monotheism must be due to missionary activity or bias were themselves using those same reports–which, remember, were so full of biased they could not be trusted to describe beliefs accurately–to generate their own theories of the origins and spread of religion. Another major difficulty with the “rebuttal from missionaries” is that it flies in the face of observed behavior. For example, many of the tribes encountered kept their belief in such a supreme being secret: “almost invariably women, children, and the uninitiated were uninformed about the supreme being” (101). This, of course, begs the question: “Why would the initiated, having learned about God from the missionaries, subsequently keep that knowledge secret from the people who taught it to them just a few years earlier?” (ibid). Thus, it seems that the allegation that any purported belief in original monotheism must have been due to missionary influence is an extremely flawed notion. Not only does it fly in the face of the way cultural diffusion works, but it also doesn’t make sense of the observed behavior of the peoples involved. 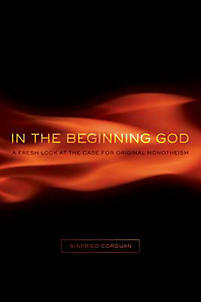 Those who wish to explore more should check out Corduan’s In the Beginning God. I have clearly derived the argument here from that book, and I’d like to credit his phenomenal piece (I reviewed it here). Book Review: “In the Beginning God: A Fresh Look at the Case for Original Monotheism” by Winfried Corduan– I review Corduan’s book and touch on only a few of the many interesting topics contained therein. Sigmund Freud, Totemism, and the origin of religion- Who cares about facts?– I analyze some of Corduan’s comments regarding Sigmund Freud’s theorizing about the origin of religion. Sunday Quote!- Is Monotheism from Egypt?– I provide a brief quote from Corduan’s book and note how it may interface with some theories related to the source of monotheism. Just because the nations surrounding Israel (which was centuries, if not ages after Noah) were not monotheistic, doesn’t mean other tribes and nations would have lost all true knowledge of God (post-Babel) through tradition and culture. I never really thought about it, but Original Monotheism makes sense, especially compared to this missionary theory. First came across this idea years ago from Don Richardson’s Peace Child, and Eternity in their Heart. i was wondering how it stood against modern scholarship. Thanks. As a missionary in Japan, this is of great pertinence to me. You might be interested in the video, “God’s Fingerprints in Japan,” that touches on the same subject. Thank you for stopping by, and for the work you’re doing in the name of our Lord Jesus.